Broccoli Cheese Soup has got to be hands down one of my favorite soups. This easy recipe will have a healthy, low calorie but incredibly filling pot of broccoli cheese soup on the table in just 25 minutes from start to finish. 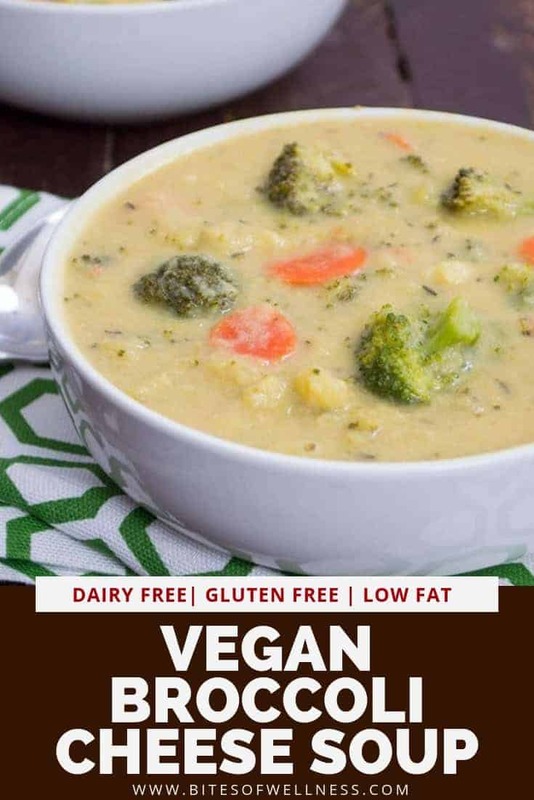 That’s right, this soup is not just vegan and gluten free, but it’s also packed with fiber, protein and is dairy free! The best part, this is a great way to get a ton of vegetable servings in one meal. There are a few comfort foods I have yet to “healthify” and broccoil cheese soup was one of them. The classic is so rich and creamy, I didn’t think I would be able to recreate that without using heavy cream or at least a few cups of cheese. But after making the Best Ever Mushroom White Bean Soup with pureed white beans, I’ve been a bit obsessed with pureeing white beans to thicken soups and sauces, and I’m constantly amazed how filling the dish is with the addition of the white beans. Well clearly I had to try this with broccoli and cheese soup, after all it’s getting chilly here and there is nothing quite like a big bowl of soup to warm up from the inside out. This soup will certainly be on my weekly rotation, it’s so easy to make and it’s pretty cheap! You could use frozen cauliflower and broccoli to really boost the savings. The big savings comes wtih not having to add 3-4 cups of cheese to the soup. Cheese always seems to make the price skyrocket. Did I mention this soup is packed with veggies. The other secret ingredient to this thick, creamy soup. CAULIFLOWER. Yup, there is a whole head of cauliflower in there as well. I told you it was packed with veggies. And these are hidden in the cheese soup, so even if your kids refuse to eat the broccoli, you can have them eat the cauliflower “cheese” and they won’t be any wiser to your little trick. I’ve actually been playing around with a cauliflower lately as well. I’m pretty convinced there is nothing that cauliflower can’t do. I can’t wait to share some creative ways to use this versatile veggie soon! So this soup is crazy simple. Only one pot is required, and the ingredient list (without salt and pepper) is only 9 ingredients. How simple is that? I’m telling you anyone can make this soup, you just need an immersion blender or blender and the best vegan cheese replacement; nutritional yeast. Nutritional yeast, if you haven’t heard of it before, is a staple in most vegan pantry’s. Not only does it taste very similar to cheese, but it’s packed with protein and other necessary vitamins and minerals. Nutritional yeast is a great way for vegans and vegetarians to get Vitamin B-12. Vitamin B-12 deficiencies can lead to low white blood cells. Vitamin B-12 is normally found in animal foods. Most vegans and vegetarians are required to supplement with Vitamin B-12 but nutritional yeast and fortified foods like grains and non-dairy milk are great ways to get Vitamin B-12 without supplements. Nutritional yeast can be found online but I really like to buy mine in the bulk foods bins at Whole Foods or Earth Fare. You can buy just what you need. However, once you try this you will want to start adding it to things like spaghetti and mac and cheese to give it a nutritional boost and that cheesy taste we all love! So now that you know how healthy this soup is, lets make a pot, put on our comfy slippers and get cozy on the couch with a good movie ok? See just how easy this amazing Vegan Broccoli Cheese Soup is to make with the video below! Let me know if you have any questions in the comments below. One pot, healthy vegan broccoli cheese soup is sure to make any dinner special. This broccoli cheese soup only takes 25 minutes, and is packed with added veggies, fiber and protein! Vegan, gluten free, dairy free, and delicious! In a large pot, add 1/2 the carton of vegetable broth and cauliflower. Cover and cook 12-15 minutes, or until cauliflower is tender. While cauliflower is cooking, chop the broccoli and slice the carrots. Once cauliflower is tender, blend the cauliflower in the pot with an immersion blender (or transfer to blender and blend in batches, being careful with hot liquids). To the cauliflower puree, add the remaining vegetable broth, broccoli, carrots, garlic powder, salt, thyme and black pepper. Stir and cover for 7 minutes, or until broccoli is tender. While soup is cooking,rinse and drain the can of northern white beans. After soaking 5 minutes, rinse and drain. Blend with 1/2 cup non-dairy milk until smooth. if the soup is too thin for you, simply simmer on the stove for 5 minutes or until desired consistency is reached. What recipe would you like to see “healthified” next? Hello, this looks amazzzzing. Could it possibly be made in a slowcooker? What is the Nutritional Yeast used for? I’ve never heard of it. Also, there is no cheese. Also, couldn’t this be prepared in the crock pot? I’ve never made it in a crockpot. Let me know how it turns out if you try it! Have you tried this yet? I was wondering the same thing. THANKS. No cheese in this soup as this is a vegan recipe. The nutritional yeast is used to give the soup a nutty, cheesy and creamy taste and texture. I just made the soup (minus the beans and the non-dairy milk), it was yum so yum that i had it for breakfast. lol! I’m so happy you enjoyed it! Thanks for commenting and letting me know! Hi, I am looking forward to making this soup later but I can’t get over the sodium level. Is that per 1/4 the pot of soup? Thank you! I just made this soup for dinner tonight and it’s so tasty!! As mom to a family of 7 vegans, we LOVE OUR Nutritional Yeast (Nooch, as we cool kids call it 🙂 and I actually ended up adding about 1/2 additional. Love all the veggies. Thanks for putting the recipe out there. Elizabeth, So happy to hear everyone enjoyed it! It’s one of my all time favorites next to my Best Ever Mushroom Soup! I made this soup tonight, it was delicious. I didn’t have cauliflower so I used potatoes instead. It turned out really good. I will leave out the thyme next time and will try it with cauliflower. The whole family loved it specially my little ones. No left overs hahaha… Thank you for this yummy recipe.. So happy you and your family enjoyed it, Karina!!!! Hello. I’m considering making this for my daughter. My question is, do you think it would freeze ok? I’m thinking to portion it out and allow her to take one for lunches at work. Thank you. Hi Michelle! I’ve never tried freezing it. It usually disappears before I can store it. If you try it, let me know! How much is a box of vegetable stock? It’s not really a standard measurement given that a lot of stores have 2-3 vastly different sizes. Thanks! I usually purchase the 32oz container. Hope that helps! I am curious about the coconut milk – did you use regular or lite? I plan on making it this weekend and appreciate you sharing your recipe. I usually use So Delicious Unsweetened Coconut Milk. You can find it by the cows milk in the refrigeration section of your grocery store. Hope that helps! Hi there! I just wanted to let you know how much I ADORE this recipe. I’m totally amazed that it’s vegan. In fact, I loved it so much I decided to feature it in my recent roundup of recipes using seasonal October produce. If you think your followers would enjoy reading it, I’d love if you’d give the article a share! Just trying to spread the goodness that is seasonal eating. Thanks again for all you do! how many ounces is a carton of broth? I love Better than Bouillon to make my broth! I will report back after trying this one! Thanks! Just made this. SO delicious!!! I made this soup today and LOVED it!!!!! Creamy & deliscious!!! I steamed my cauliflower in one pot with some veggie stock and sautéed minced onion, garlic, carrot & celery in the other with a tad of olive oil. I emulsified the cauliflower pot transferred to the other pot and added more stock and emulsified before proceeding to the other steps. I use a mirepoix in everything so I had to add it. More steps and prob not necessary. I love nutritional yeast!! This soup was awesome & totally being added to my weekly rotation! The cauliflower made it so creamy!!! I make soup every Monday so I have it for lunch all week!! This is a great one!!! Oh my gosh, thank you for this recipe. It is so good and addicting. I’ve made it twice this week alone. It is delicious! I feel like I’m cheating but I’m not! I mad this soup on Sunday night with the intention of taking some for lunch the next day. Instead my husband and I kept going back for “one more bowl” until nothing was left. 🙂 We will definitely make this one again, Great recipe! I have made this soup twice, we love this recipe! 2nd time I made with my own homemade veg broth. Turned out soooo good. Thank you for recipe. 5 stars, highly recommend. Just made this and it’s yummy! Thanks for this recipe! I tried it, it really is quick, easy and delicious, everybody including kids loved it! I used frozen broccoli and cauliflower and added some other veggies (pumpkin and chinese leek) and I don’t think it made a big difference! Thanks again! I just made this using Hemp milk and mung beans!! I didn’t have white beans prepared, & I prefer not to use canned beans. It’s A-M-A-Z-I-N-G!! I’m new to being vegan and this hits the spot. Thank you so much for the recipe . I will definitely be making this again and trying different versions. I just made this and it’s delish! Thanks for sharing. I made this today. Delicious! I doubled the recipe to feed 5 adults and make sure I had a bit of leftovers. Instead of doubling the cauliflower, I used 1 head of cauliflower and broccoli each for the creamed base. Also, I accidentally opened chickpeas instead of navy beans. It worked. Tastes great! I will be making this again! Thank you so much for this recipe. It is delicious. My 21 month loves it too. I made it the first time with broccoli instead of cauliflower and it was good. Then I tried with caulifower and it was yummy. Both times I left out the Beans because I am eating paleo/whole30. I have made this four times already- quick and easy. Great way to get my veggies in and use nutritional yeast that I have been wanting to use for a long time. I didn’t have Northern beans, so I used chickpeas instead and it was super yummy! This soup was delicious!! I added a little paprika to give it a kick. I also added some go veggie cheddar cheese at the end but realized I really didn’t need to do that, the soup is awesome as is! I would recommend leaving out the beans. I just made this and the beans ruined the taste of the soup. 10/10 would not recommend using them and just follow the recipe without that. It was thick enough without them as I used a lot of cauliflower. Sorry you didn’t love it with the beans, but I’m glad you liked it without the beans. Thanks for the feedback! I am definitely going to try this yummy looking soup! As a vegan/vegetarian who has done some significant research, I understand that vitamin B12 does not come from animal or plant sources (referring to your mention of it that it comes from an animal source). That is why it is recommended that vegans take a B12 supplement. I am crazy about anything with cheese or made of cheese and I love brocolli! Great combo! Thanks for sharing this! I absolutely love Broccoli Cheese Soup, so I can’t wait to try this version! It looks so dang good! Thanks for sharing it at the #SmallVictoriesSundayLinkup! Mmmmm!!!! I love cheddar broccoli soup!